We’ve lived in our current place for two years. For a majority of those two years, I haven’t been content with the way it’s decorated. Instead of re-decorating, I chose to focus on the things standing in my way: we rent, we have white walls which refuse to come clean, I don’t have a massive budget. On top of that, decorating has never been my gift. What color do I pick? Where do I hang it? What if I hate it? Is it too tall? Will it look like it belongs with the rest of the room? Instead of making decisions, I chose to do nothing. Then I read The Nesting Place. It delivered just the challenge I needed–do something. Don’t let fear of making the wrong decision paralyze you. Do something. So, armed with my budgeted amount and a couple of Target gift cards, I made my list. Off I went. Here are the results. I stumbled across the green curtains at a garage sale, and thought they would match my green lamp (un-pictured) perfectly. They did! I pulled down the gross blinds, and hung these. Instead of purchasing a new comforter, I pulled an old down comforter from storage. I still would like to find a new duvet, but for the time being, I’m satisfied. 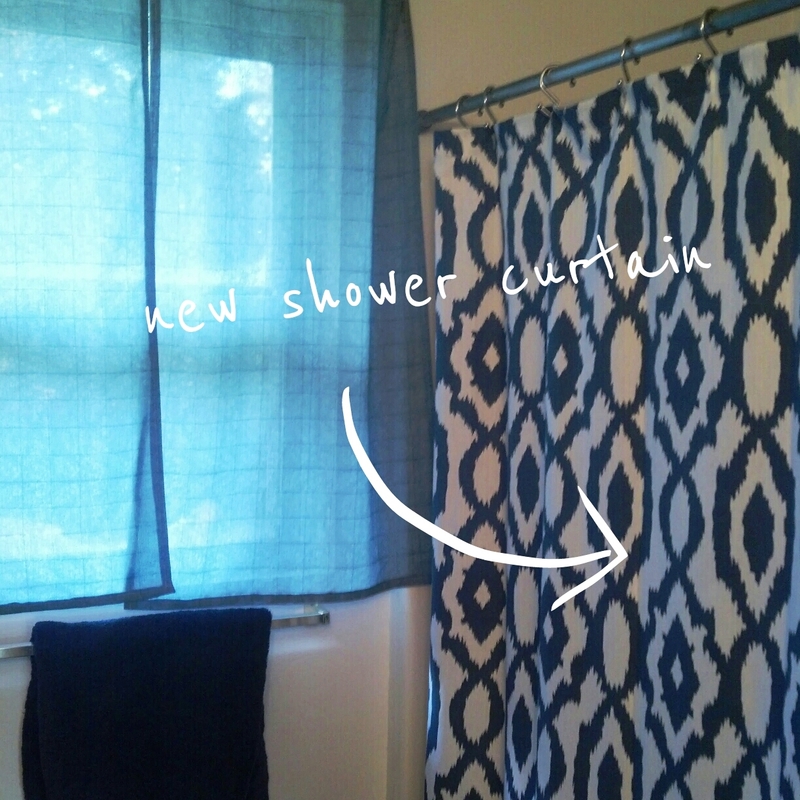 We needed a new shower curtain. I’m not being dramatic. This one was on the “Need” list. The bathroom has bothered me since the second I moved in. There was a toothbrush holder under the mirror that was falling off the wall, and the holes were too small for our toothbrushes, rendering it useless on top of ugly. There was also a long towel bar that extended over the toilet for the hand towel. 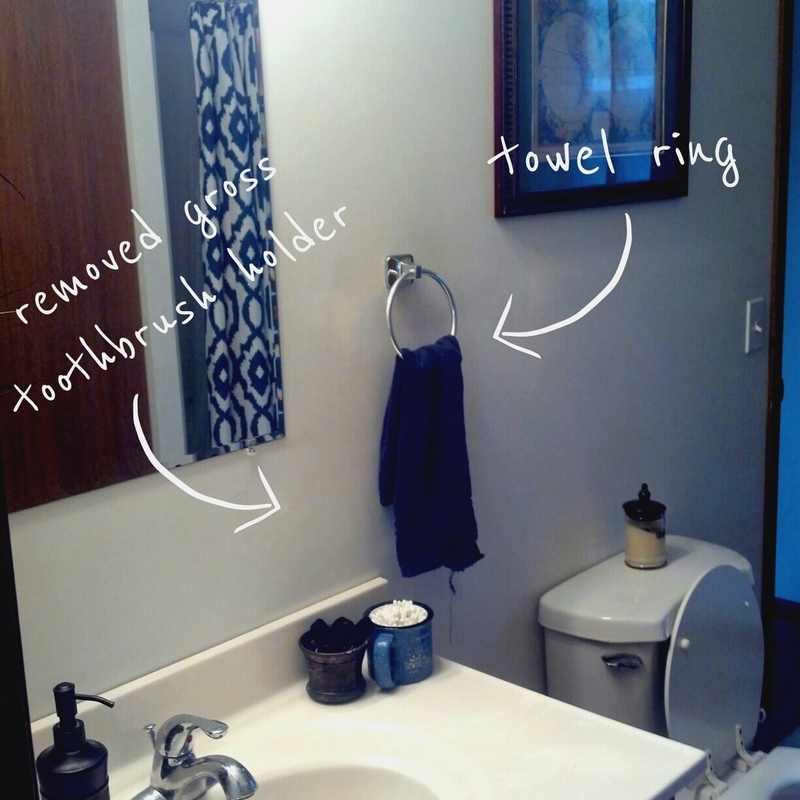 A little plaster patch and a new towel ring, and it looks much better! 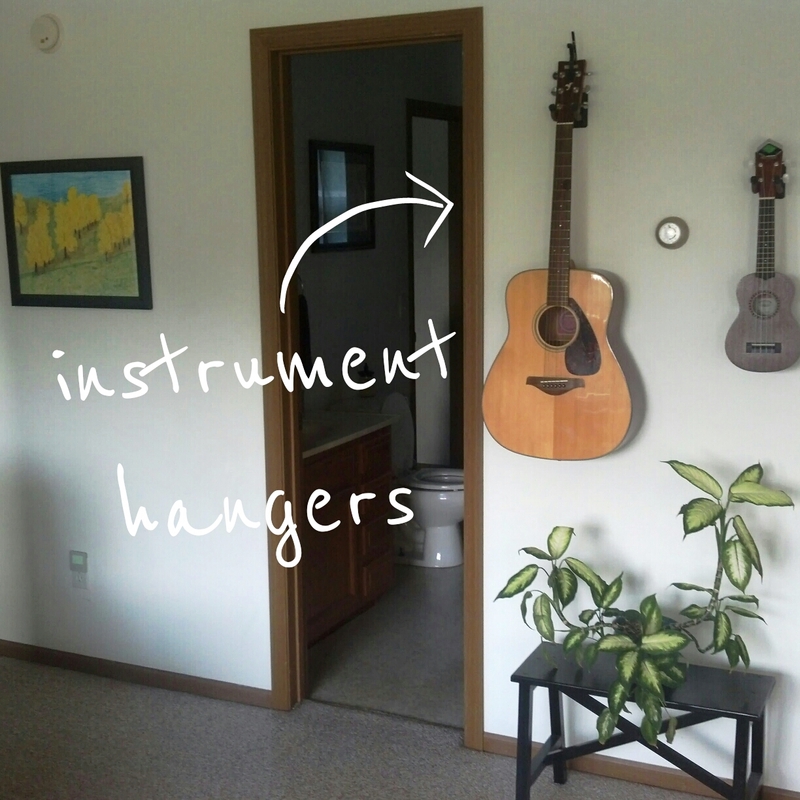 I’ve always loved the look of guitars hanging on the wall. We bought these hangers, and love them. We had a floor lamp that stood in this corner, and worked perfectly. The only problem was it looked like it came from the early ’90s. I found this gem at Goodwill! Plant stand and lamp in one. Finally, curtains in the office! I pulled down the blinds, and hung these guys. And there you have it. 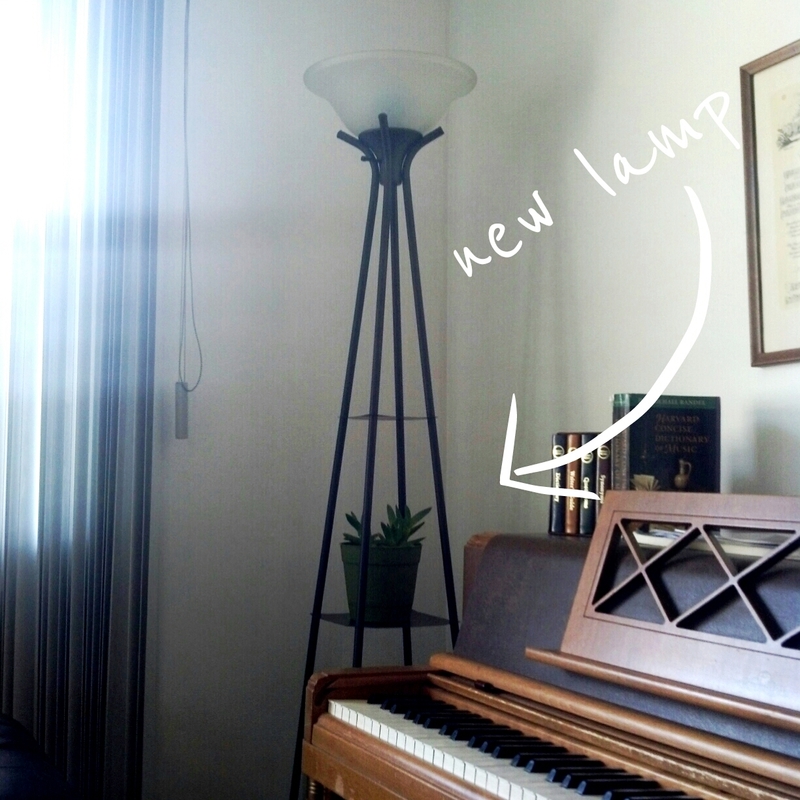 Small changes, but they make our house feel much more homey than it did. And the grand total: $100, spent over the course of a couple of months. 1. What do you already have that you can use? In my case, I already had a down comforter and a curtain rod just hanging out in storage. What could you move from one room to the next for a more ideal location? 2. Shop second hand. Look at thrift and consignment stores, and be willing to think outside the box. Can you cover those pillows? Shorten those curtains? If you have a Habitat ReStore near you, check them out–they have a random and wonderful collection of home repair and decorating items. 3. Be patient. 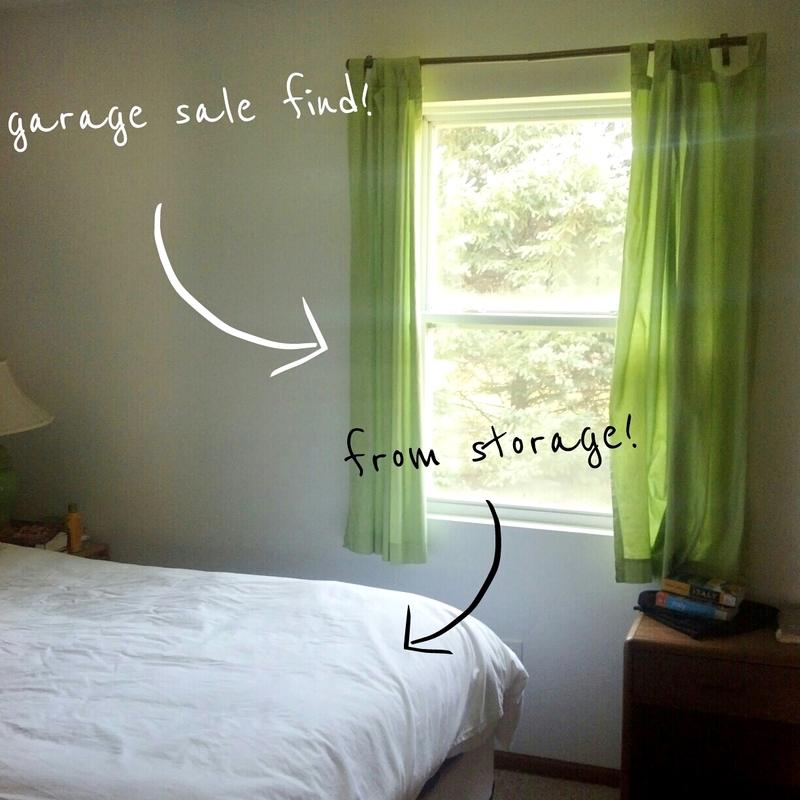 You’re not going to strike gold at every thrift store or garage sale you hit up. Be willing to check back again in a week or two and see what else is there. 4. Make a decision. Even if you hate it, could you return it? Could you use the item somewhere else? If the financial commitment is small, take the risk! 5. 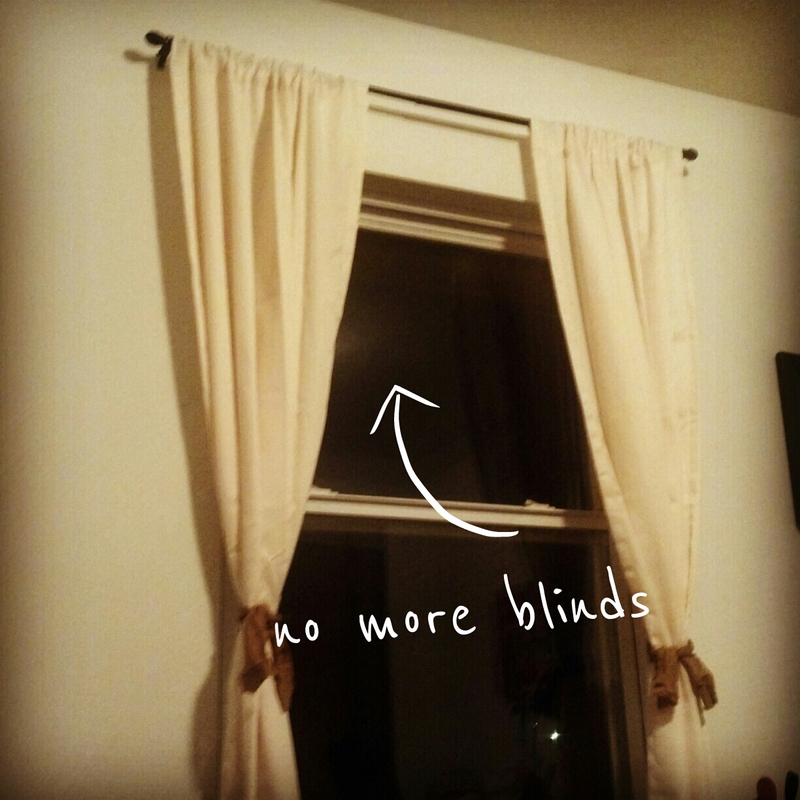 In order to get the most bang for your buck, do curtains first. They make all the difference in the world, and don’t have to cost a fortune. 6. If you rent, focus on the things you can take with you–art, curtains, pillows, etc. This way, you won’t be leaving your investment behind when you move. 7. Finally, do something. Remind yourself that most things can be undone (take down those curtains, move that picture, etc). Don’t let yourself be trapped by fear, and make something happen! I wanna know: What other tips could you add to the list? How do you decorate your home?